Your garage door is incredibly heavy and does not rely on the motor, alone, to open. To aid the process are one or two torsion springs, which allow the weight of the door to be carried safely during use. These springs wear down over time and once they are no longer viable, your door will stop opening. If you have worn out springs then call a professional right away as these can make the heavy door dangerous to be near. 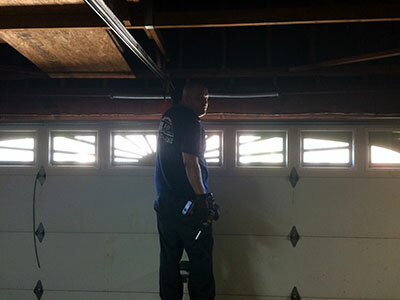 The garage door track is an important component to a functioning garage door. As such, it can become overused and either warp, become displaced, or simply deteriorate over time. A misaligned track can be very dangerous when operating the door so it’s important to fix it right away. A simple battery replacement in your garage door opener could be a quick fix to a nonresponsive door. Likewise, check the batteries in the transmitter as well. If you are successful in getting the motor to run but find that the door fails to open, then your emergency mechanism could be engaged. The switch to the device is usually attached to a knob or a rope and can sometimes be tugged by accident. Check for the knob or rope and be sure that it is connected with the switch. Insulation can help prevent outside temperatures from leaking in as well as helping protect the other items in your garage from the daily use of the door. Furthermore, it can help soften the noise made when the door is operating, making insulation more of an upgrade for your door rather than a repair. If your garage door goes down with a loud thud then it is likely that your tension spring isn’t working properly. Check to see if it is broken or disconnected somewhere. If it is, the garage door needs spring replacement. Due to the heavy nature of the door, it can be very dangerous to leave it unrepaired or work on it yourself. These problems can make your door dangerous but are generally easy for a professional to repair. It is always best to call one right away for your garage door repair.